Another masterful sculpt by the dynamic meister Yukishiro. 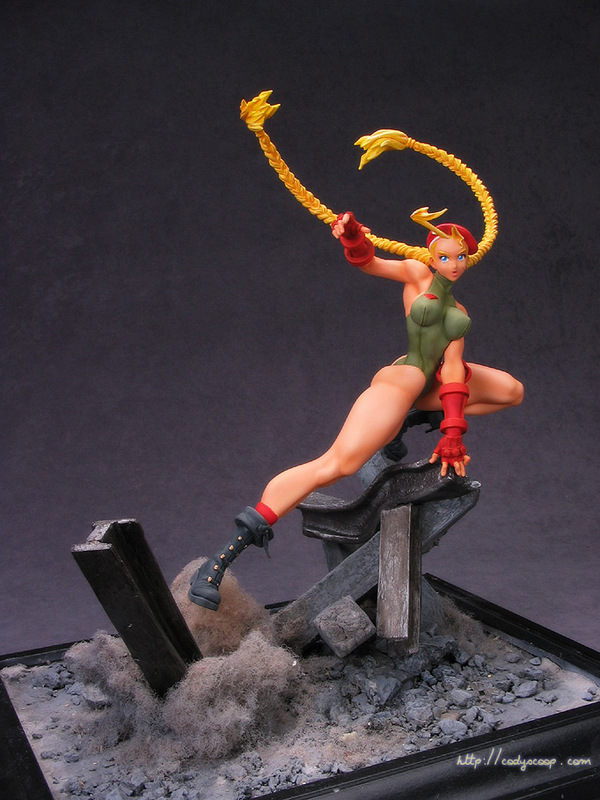 This Cammy was offered as a limited GK a year after his Blue Mary and Mai Shiranui pair, but was never reissued. It turns up later as a smaller 1/12 PVC collectible figure. The figure here is the larger 1/8 GK offering. This pose was a bit of a brain teaser for me to figure out a base for. As the blog thread mentioned, I had no idea what the base would be like until I actually semi-finished the figure. But the beam she’s on and pose made this perilous construction site kind of the only reasonable choice I could come up with, and I liked how all the debris and pillars worked out. The purists may notice that her legs have no camo patterns. I’ve struggled with this decision a bit since I’ve always tried to be accurate with respect to the character specs. But in the end I think the camo ruins her shapely legs quite a bit, so she’d be better off without them. Click here for her construction feature.